There's more to choosing a kitchen sink than just looks. Stainless steel is so called because it is steel combined with nickel and chromium designed to be imperious to rust and other problems. Stainless-steel sinks are easy to clean and don't get chipped like porcelain sinks do. Go to a home improvement store that sells stainless-steel kitchen sinks. Look at the store's stainless-steel kitchen sinks to see how many bowls you want for your kitchen sink. If you cook a lot or have a large family, two bowls is probably a good idea. If you live alone or don't do a lot of cooking, you can probably get by with one bowl. Examine the stainless-steel sink's gauge or thickness. The thicker the gauge, the more resilient the sink will be to dents and the less noisy it will be as well. Gauges 16 to 18 are good for stainless-steel sinks, according to Home Style Choices. Plumbing 101 suggests gauges 18 to 20 for stainless-steel sinks. Look at the store's kitchen sinks for the stainless-steel finishes they offer, either satin or glossy. Stainless steel with satin finishes will last longer and look good for a long time, while glossy-finished sinks might scratch or crack. Measure the stainless-steel sinks you look at in the store and see how deep you want your kitchen sink to be. A deep sink will allow you to fit more dishes or vegetables in it for washing, while a shallower sink won't. Look at the store's kitchen sinks to see the different top mount and undermount stainless-steel sinks they offer. Top mount sinks are cheaper and easier to install, but undermount sinks are easier to clean and make the sink and countertop look streamlined. 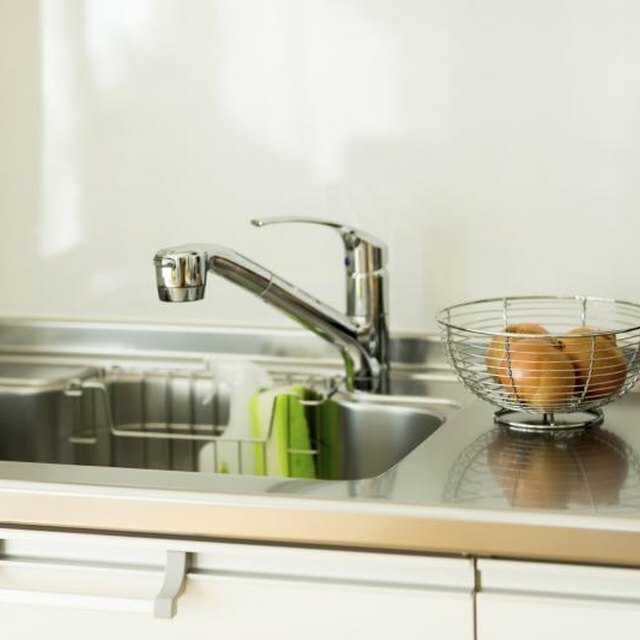 Write down your preferences for a stainless-steel kitchen sink and talk to a store employee to find out if they sell the kind of sink you want if you do not see it on display.